Cider enthusiasts know that authentic ciders are crafted from cider apples, but they rarely get to see or taste them as fresh apples. 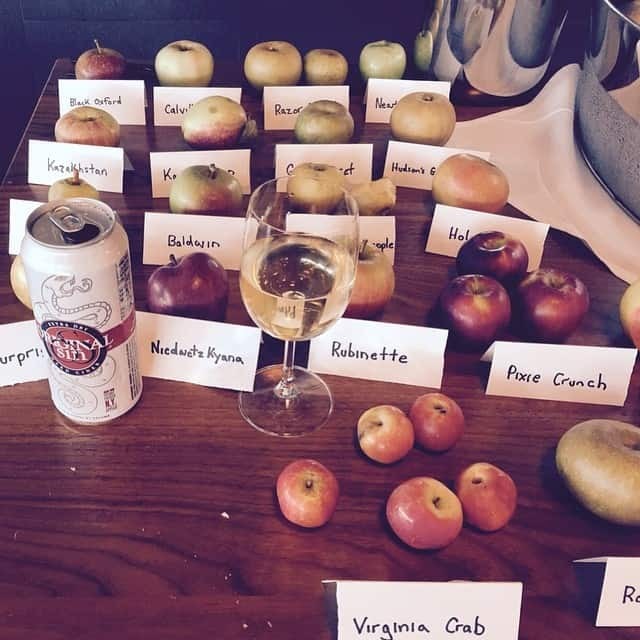 Join Gidon Coll, the founder of New York based Original Sin Cider, in an apple variety presentation and tasting on Thursday, September 29, from 6–9 p.m. at Mullers Cider House in Rochester, New York. Gidon, who in 2012 planted a small orchard on his family’s old dairy farm in the Hudson Valley, will be bringing some of the apples from his orchard for this special event. Apple varieties that will be on hand will include Kandil Sinap, Harrison, Karmijn De Sonneville, Harry Master’s Jersey, Niedwetzkyana, Pixie Crunch, Orlean’s Reinette, Hawaii, Pitmaston Pineapple, Kidd’s Orange Red, Razor Russet, Virginia Crab, Roxbury Russet, Ashmead’s Kernal, Rubinette and Calville Blanc, as well as apples from Kazakhstan. Join in on the fun at Mullers Cider House, located at 1344 University Ave. in Rochester, NY; phone: (585) 287-5875.